As I mentioned in an earlier posting, book covers really make a difference in grabbing readers attention. Since art direction is what I do in my real job I couldn’t resist doing a little bit of it here too. Dreamspinner Press art director Paul Richmond sent me a number of samples from various artists to give me an idea of what style I might like and what was available. I just looked at the art—not the name of the artist—and just so happened to land on Paul. A number of his covers had a great painterly quality along with some very handsome men. I had such a clear idea of what I wanted the cover to look like that I had to send Paul my own sample. Just because I’m an artist doesn’t mean that I can draw anything. I have my limits. I do what I’m good at and then I hire someone else to do the things they are good at. My sample was created with a combination of SketchUp (a 3D computer drawing program) and Photoshop. The composition is what I really wanted to convey. My challenge was to convey handsome men and yet not clearly depict their faces. I wanted my readers to be able to fill in the faces with their own imagination. For that reason the over-the-shoulder shot works best. It puts Carlos’s muscular shoulder at the edge of the frame and makes Michael appear to be the object of his affection. 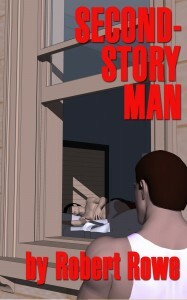 At the same time, as the title indicates, it appears that second-story man Carlos is up to no good. So here is my sample composition. This is where the real magic comes in. Paul took my sample and reworked it slightly to adjust the composition. He sent me a line drawing that I made a few notes on and I also gave him color direction. I knew that I wanted a cover in shades of blue to indicate that it is nighttime. I also wanted light streaming in the window from some off camera streetlight to illuminate Michael. I wanted Michael to glow like an angel. Paul sent me his first color pass and I again made some minor notes. Carlos had gotten a little pale for a Latin man and I wanted the title to have a little more punch. Well, the final product came out great. Far better than anything I ever could have done myself. 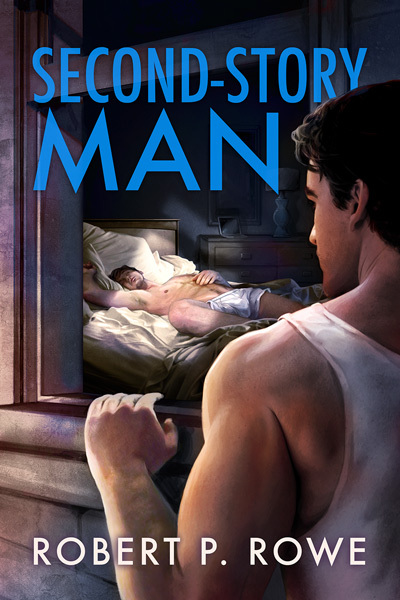 Post your answer in the comments and I’ll be choosing a winner for an ebook copy of Second-Story Man just before Midnight Eastern Time. Feel free to post any other questions or comments that you may have too. If you posted your answer this morning and didn’t win don’t worry—you’re still in the running. If you missed this Release Party contact me through my Contact page on my website. You can also contact me right here at Dreamspinner Press on my author page. I’m always interested in your comments. Thanks H.B. Who knows maybe Paul and I will work together again once my next book is ready.